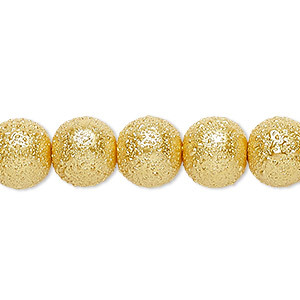 Bead, Celestial Crystal® and MoonScape, glass pearl, gold, 8mm textured round. Sold per (2) 15" to 16" strands. The textured surface of each glass pearl adds dimension and visual interest in attractive colors that offer jewelry makers stellar design possibilities. Size and shape may vary slightly and color may vary from dye lot to dye lot. Some strands may have slightly irregular shapes, sizes or minor surface blemishes. 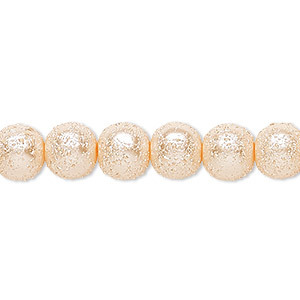 Bead, glass, opaque champagne, 8mm textured round. Sold per pkg of (2) 15-1/2" to 16" strands. 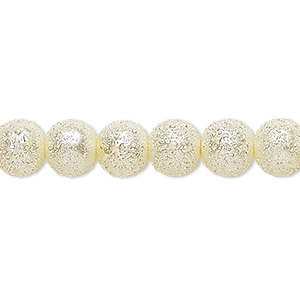 Bead, glass, opaque ivory, 8mm textured round. Sold per pkg of (2) 15-1/2" to 16" strands. 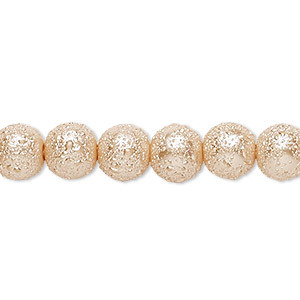 Bead, glass, opaque peach, 8mm textured round. Sold per pkg of (2) 15-1/2" to 16" strands. 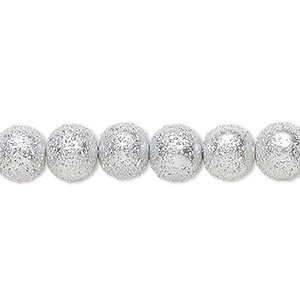 Bead, glass, opaque silver, 8mm textured round. Sold per pkg of (2) 15-1/2" to 16" strands. 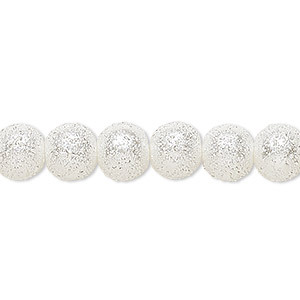 Bead, glass, opaque white, 8mm textured round. Sold per pkg of (2) 15-1/2" to 16" strands. 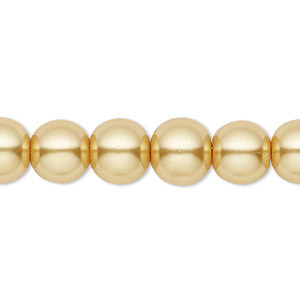 Bead, Celestial Crystal®, glass pearl, gold, 10mm round. Sold per pkg of (2) 15-1/2" to 16" strands, approximately 80 beads. 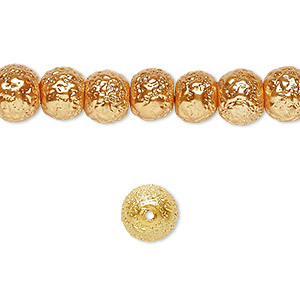 Bead, glass, opaque gold, 10mm textured round. Sold per pkg of (2) 15-1/2" to 16" strands. 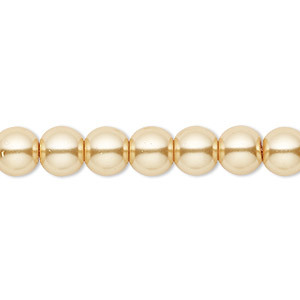 Bead, Celestial Crystal®, glass pearl, gold, 4mm round. Sold per pkg of (2) 15-1/2" to 16" strands, approximately 200 beads. 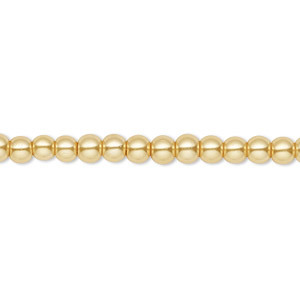 Bead, Celestial Crystal®, glass pearl, gold, 6mm round. Sold per pkg of (2) 15-1/2" to 16" strands, approximately 130 beads. 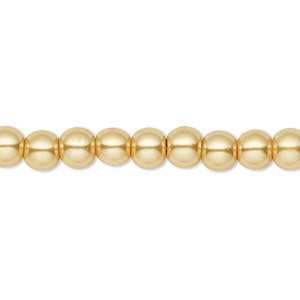 Bead, Celestial Crystal®, glass pearl, gold, 8mm round. Sold per pkg of (2) 15-1/2" to 16" strands, approximately 100 beads.